Remedial and refurbishment work to B+ Listed Church. 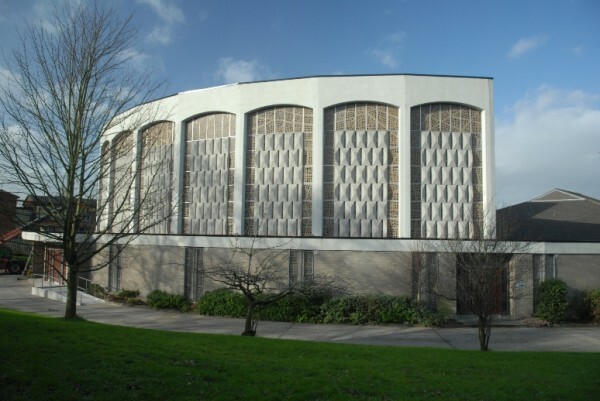 The 1967-built church, at Rosetta Road in Belfast, is distinguished for its use of innovative construction techniques on a scale which is extremely rare in Northern Ireland. It is therefore of national and international interest. 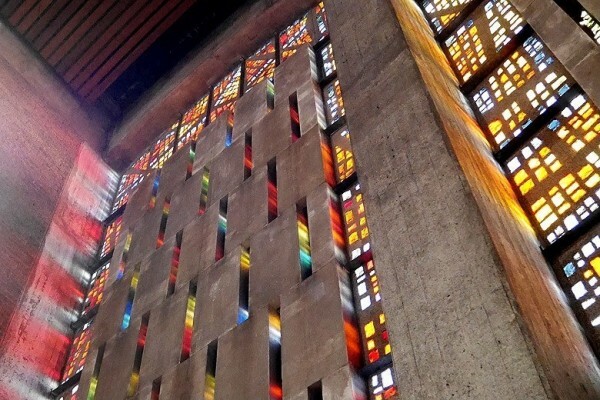 A programme of refurbishment work was conducted to the B+ Listed Church over a seven month period. Protection of the marble floor and statues. Restoration of the Dalle De Verre glass panels. 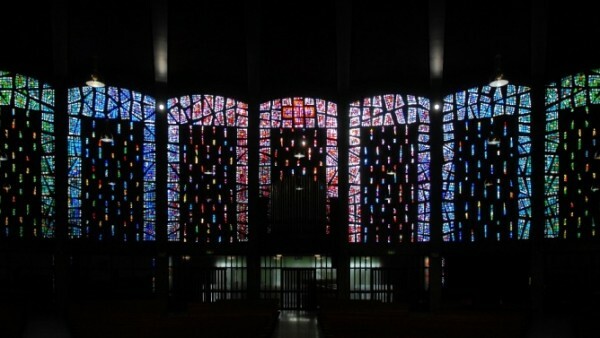 This involved over 20,000 pieces of solid coloured glass. Repair of the exterior blockwork. Demolition of existing toilet block and construction of new wheelchair accessible toilet facilities. Creation of a new plant room (using the redundant female toilet room). Upgrade of the electrical system. Re-lamping of downlights in the Church. Installation of a gas heating system and new heating in the Crying Chapel. Installation of new suspended radiant heating panels on the ceiling beams. 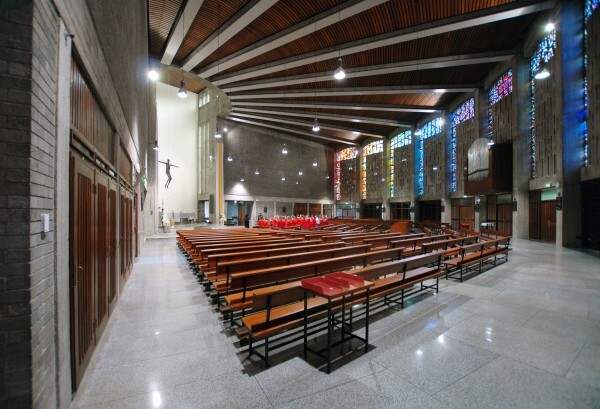 Fan convector units fitted in the confessionals to provide additional heat to the body of the Church when required. Re-modelling of the sanctuary area. New bespoke nave and Altar furniture in keeping with the original designs. Removal of external extract grilles and provision of new matching concrete bricks. Refurbishment of the pews and kneelers - sanded, lacquered, painted and upholstered. Repainting of the wall behind the Alter. Relocation of the Baptismal Font into the body of the Church. Refurbishment of the Altar Boys room. Re-roofing with insulation and felt (previously asphalt), then sealed. Construction of a wheelchair accessible access ramp. Repair and cleaning/polishing of the marble and terrazzo flooring. Structural checks on internal and external sculptures. The project has been described as an ‘exemplar scheme’ by the Northern Ireland Environment Agency (NIEA) Historic Buildings Unit, who were kept fully updated throughout. 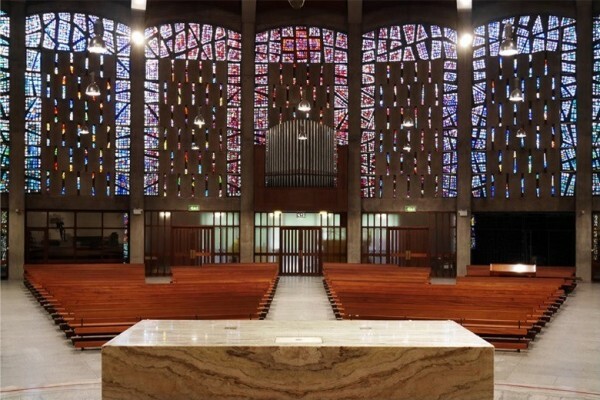 A bit more information about the the St Bernadette's Church project.